We Are Full Handyman Service, We Offer Free Estimates, and No Job Is Too Small Or Big For Us, We Service Entire Ft. Worth, HEB, DFW Metro. » Do you need something wired, checked and installed? Electrical work, breakers, lights, plugs and any modifications. » Switches, new circuits, Tesla car chargers, battery chargers. » Kitchen renovations, garbage disposers, dishwashers installed, microwaves. » Painting of rooms, front door staining and painting walls and sealings. »Kitchen renovations, garbage disposers, dishwashers installed, microwaves. »Painting of rooms, front door staining and painting, drain cleaning. 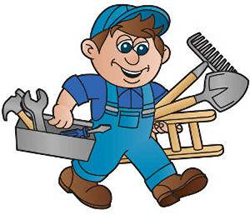 »Plumbing repairs (including replacing faucets, sinks, repairing leaks, running toilets, garbage disposers. »Floor coverings installation and repair. ceramic tile, laminated, hardwood, vinyl products. »Saltillo Tiles, Terra Cotta, Mexican tile, Turkish & Italian marble and natural stones, installation. »Hardwood, bamboo flooring glue or nail down, kitchen and bath remodeling.